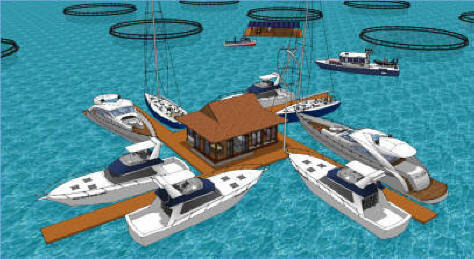 The Recreational Fish Farming (RFF) concept combines enterprise with philanthropy – merging destination resorts with commercially viable fish farms. Strategically placed near isolated waterfront communities along the most sought after cruising routes, each stand-alone RFF unit provides a boost to the local village - providing direct full-time employment for 20 or more villagers per unit; increasing local tourism and creating many indirect employment opportunities that include support and provisioning services as well as the potential for multiple fish related industries; such as, processing, preserving, storing, transporting, marketing and selling fish and fish products. Cultural exchange and entertainment elements can also improve the prospect of a healthy and vibrant community. The boater will find, with each RFF unit, a safe harbor with superb overnight facilities; on par with what one may find in any five-star accommodation. Whether it’s an overnight stay in a prestigious villa, a secure side-tie to the floating pier or just a tie-off on a nearby mooring; the boater will find safety, not only in numbers but under the watchful eyes of a well trained security team. 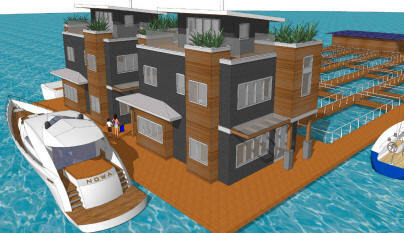 The boater will also have nearby access to fuel, sewage pump-out and provisioning services. Each facility will be well maintained and managed to provide the ultimate in service, as well as a viable long-term enterprise for the local community and the Recreational Fish Farming investor. The Villa Cluster Unit generates the ultimate destination resort atmosphere, with convenient access to fellow travelers while ensuring the desired level of privacy. The centralized platform is the heart of the complex…it is the place to be for food, fellowship and entertainment. It includes a restaurant/coffee bar with indoor and outdoor dining areas, and allotted space for entertainment. The platform includes: both solar and wind power generation systems; security facility; centralized power storage and back-up power generation; cooking fuel storage tanks; fresh-water and gray-water storage tanks, and treatment apparatus; sewage and trash collection and containment; laundry facilities; and a service vessel landing area for the provisioning of the complex. The fish farming activities surround the villa cluster; however, more at arm’s length. 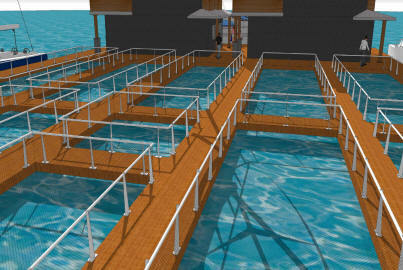 The fish cages can be sourced locally with lower cost, commercially available materials. 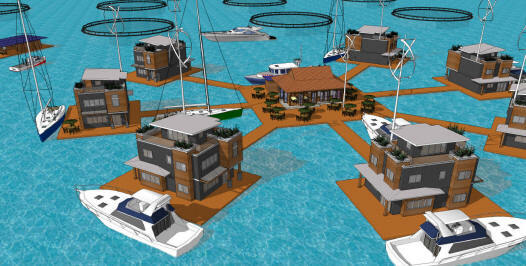 The plan allows fish farm cages to be moved independent of the villa units; permitting the villa units to be anchored in a more permanent position. 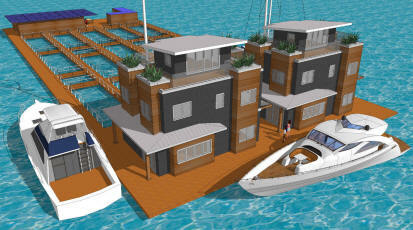 The Star Pavilion Unit’s primary focus is to provide safe harbor mooring for cruising vessels. The pavilion integrates food preparation, lounge, and a full-time communications and security center.